ATTENTION FOOD & BEVERAGE INDUSTRY! This redesign reflects up-to-date nutritional science, modern dietary recommendations, and features a simpler layout to make it easier to understand at a glance. 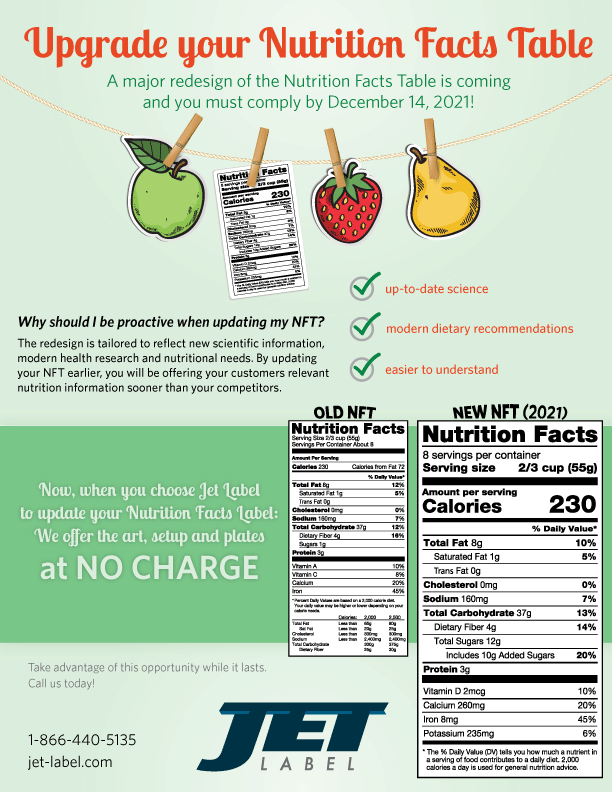 By updating your NFT earlier than December 2021, you will be offering your customers relevant nutrition information sooner than your competitors. Plus, when you choose Jet Label to update your Nutrition Facts Table now, we offer the art, setup and plates AT NO CHARGE! Take advantage of this opportunity while it lasts. Call us today at 1-866-440-5135 to speak to one of our team members!